Martha Rosler, Tron (Amputee), 1967-72, photomontage, 24 x 18". The Vietnam War was the first to be televised, and though broadcasts of its carnage spurred many to antiwar activism, they also demonstrated modern media’s ability to compress images of violence behind screens and between commercials breaks. Online, banality mixes with atrocity with even greater ease. Pop-ups advertising resort getaways obscure environmental disaster reports. On our individual feeds, articles on war or terrorism pulled from the 24/7 news cycle are sandwiched between pet photos and brunch updates. In this mini survey, Martha Rosler proves deft at dissecting and reconfiguring mass media to restore discomfort with such constellations. 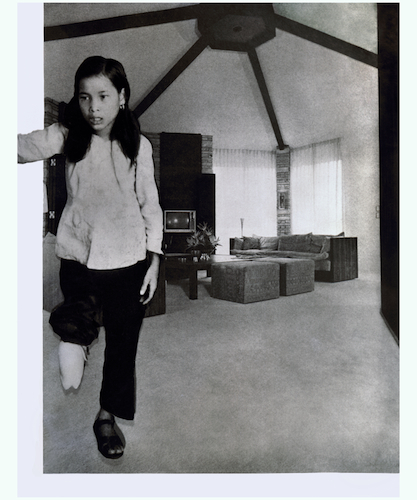 Her “House Beautiful: Bringing the War Home” montages, 1967–72, splice together Vietnam War–era photojournalism with spreads from House Beautiful magazine, the latter full of home and beauty tips for the upper-middle-class aspirant. In these works, war moves beyond the page and TV screen, encroaching upon 1960s and ’70s domestic bliss. Beauty Rest transplants a picture-perfect mattress ad’s family to a bombed-out bedroom. In Tron (Amputee), a Vietnamese woman balances on her good leg—the other severed and bandaged—inside a vast ranch-style living room. The series’ prescience is underscored through its display with the 2003–2008 reprisal “House Beautiful,” which sets photos of the Web 2.0–era Iraq War against images of affluence and consumption: Models catwalk next to a corpse; a Paris Hilton doppelgänger checks her cell phone while gunfire rages outside her glassed-in condo. Ripostes to advertising and its cousin, stock photography, have become something of a standard in contemporary art, but most lack the political bite of Rosler’s enduringly moving, unsettling hybrids.